A little piece of my soul dies each time I’m away from New England in the Fall. Don’t get me wrong. Emilia-Romagna is a pretty spectacular place to be at any point during the year, but nobody, and I mean nobody, does fall quite like New England. There’s really no place more beautiful. We used to go up to New Hampshire each fall and drive along the Kancamagus highway to see the leaves turning. Every year, at the very end of the highway, there was the apple man. Rain or shine, on autumn weekends he drives down from Maine to peddle apples and his unpasteurized cider from his dilapidated truck. It sounds sketchy I know, buying unpasteurized cider from a truck on the side of the highway, but seriously, hands down, the best cider I’ve ever had. And I’m from Boston. I drink a lot of cider. A cider connoisseur if you will. If going to New Hampshire during the fall, a trip to Polly’s Pancake Parlor is always in order. I mean, the restaurant is devoted to pancakes. That’s reason enough to journey up there. Unfortunately for ski families like mine, the restaurant shuts down during winters so you have to make the trek there during spring, summer or early fall. Need more incentive? Not only do they have great pancakes, but if you’re indecisive like I am, they let you mix and match your flavors of pancakes (and man oh man, do they have a lot of flavors). This charming joint, a shack built in 1830 that was converted into a restaurant during the great depression, has been owned and operated in Sugar Hill, New Hampshire by the same family since 1938. Trot Trot the Swedish horse hasn’t been there since 1938 perhaps, but he has been there as long as I can remember. Even though I’m 24 now, I still feel the urge to fling myself onto Trot Trot’s back every time I come to Polly’s. Old habits die hard. For all its quaint, rustic charm, Polly’s is very up to date on dietary issues and has a variety of gluten free, dairy free, whole wheat pancakes etc. and for those of us with nut allergies, they even have a special nut free griddle. I’m going to sound crazy for admitting this, but I don’t even go to Polly’s for the pancakes. 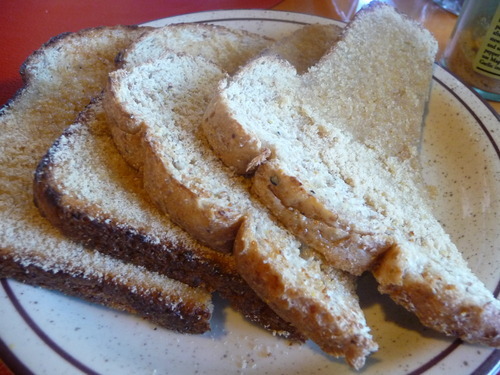 This is lunacy, I know, but my absolute favorite thing to get at Polly’s is maple toast. The town is called Sugar Hill so you know the maple sugar is supreme. I’ve recreated my own version below using some maple sugar purchased at Polly’s since I’m an ocean away from my beloved New England. You too can buy your own maple sugar (or the famous pancake mixes) from Polly’s here. Serves 1 Leaf Peeping, Maple Loving New Englander on a fall day in Italy that is not nearly crisp or colorful enough (sigh). 1. Toast bread until golden brown. Slather it excessively with butter (this is what makes the maple sugar stick obviously). 2. Add 1/2 tbs (or to your taste, it really depends on how large your piece of toast is) maple sugar and spread over the toast so it gets slightly gooey. Enjoy!